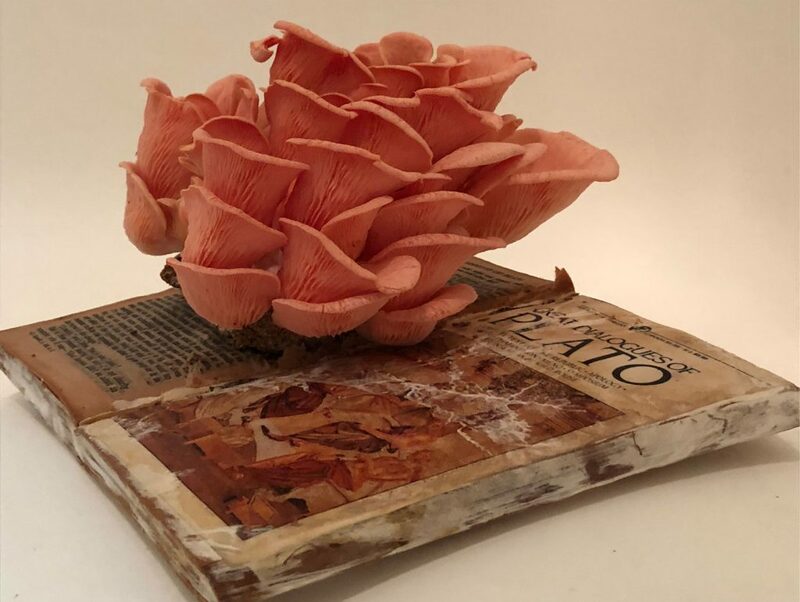 The fungus is reading Plato. Or is Plato reading the fungus? Which represents knowledge, the mushroom or the book? Thinking like… texting like… responding like… a mushroom. In an era of mindfulness in what one eats, thinks and does, why not consider a more ecosystemic approach, advancing the whole and communicating across all of the parts? Cesar & Lois practices thinking like a mushroom, collectively and with others – that is the only way to think like a mushroom. Observe fungal growth at different stages. Consider the microorganism’s strategies of growth, how the organism expands and who and what benefits. Reflect on one’s own capacity for growth and motivations for advancement. Observe the conduits and circuitry for biological and environmental information passed within and through the fungal system. Advance the human circuitry for the same. Growing mushrooms on books requires a longterm commitment, patience and also the right book. The above books were carefully selected – some heirlooms of knowledge passed from mother to daughter, others tomes on designing landscapes, espousing a reordering of the natural system. Such books demand colonization; they are just asking for cultivation by nature.